The Arts and Industries Building was the first building to serve as the US National Museum. 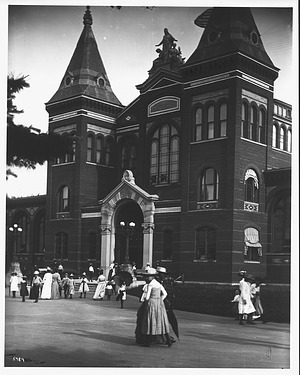 Designed by architects Cluss & Schulze, this brick building with expansive galleries opened in 1881, with exhibits on art, culture, history, geology, and natural history. It was renamed the Arts and Industries Building in 1910. "Perspective of proposed annex to the Smithsonian Institute Building." Preliminary drawing by Adolf Cluss and Paul Schulze of the new United States National Museum Building, now the Arts and Industries Building. 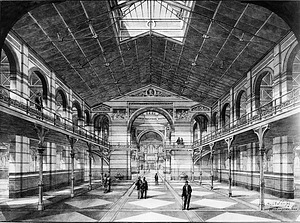 Drawing rendering the interior of the Arts and Industries Building done by the architects Cluss and Schulze, June 1878. This drawing shows visitors in a hall, but no exhibits. The West Hall looking towards the Rotunda of the new United States National Museum, now the Arts and Industries Building, decorated for President James A. Garfield and Vice President Chester A. Arthur's Inaugural Ball, March 4, 1881. This was the first event held in the new building, before the exhibits were installed. 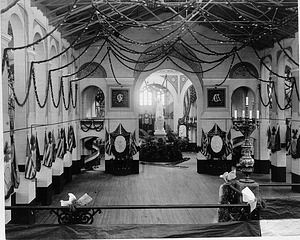 A temporary wooden floor was laid for the event, two electric lights were placed in the Rotunda, 10,000 bins for hats and coats were erected, 3,000 gas lights were installed, and festive buntings, state flags and seals decorated the halls. A colossal "Statue of America" stood in the Rotunda, illustrative of peace, justice and liberty, grasping in her uplifted hand an electric light "indicative of the skill, genius, progress, and civilization" of America in the 19th century. The stencil work in the Rotunda can be seen. 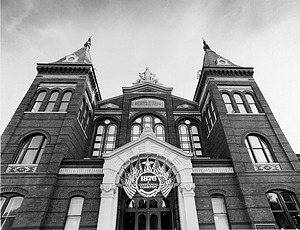 The building opened to the public in October 1881. 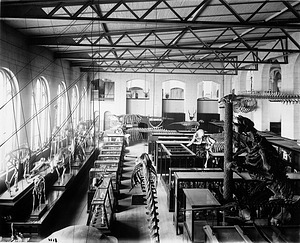 Installation of the Comparative Anatomy Hall in the new United States National Museum, now the Arts and Industries Building. 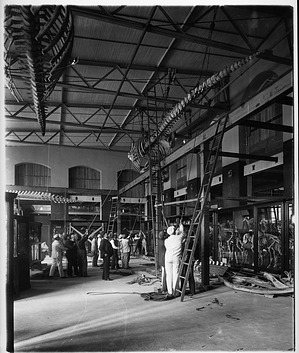 Workers can be seen using a pulley system to raise the skeleton of a whale to the ceiling. Quadruped skeletons are visible in cases on the floor. In the Paleontology and Comparative Anatomy Exhibit (Osteological Hall) from the 1880's in the South-East Range of the United States National Museum, now the Arts and Industries Building, are skeletons of mammals, marine mammals and a giant sloth (Megatherium). Some skeletons are in exhibit cases and others are hanging from the ceiling. 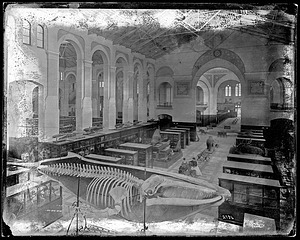 Natural History Exhibit in the South Hall of the United States National Museum, now the Arts and Industries Building, c.1881-1887. In the foreground of the picture is the whale skeleton (before it was hung from the ceiling). View includes two women sitting on benches in the exhibit hall, the Seal exhibit, and the Rotunda with its stencil work before the "Statue of Freedom" was placed there. The museum is still newly opened because the galleries have not yet been built. Prehistoric Archeology Exhibit was in the Southeast Range of the U.S. National Museum Building, now the Arts and Industries Building. A female attendant is seated in the hall. In the background the dinosaur skeletons of the paleontology exhibit are visible. The lecture room in the West North Range in the United States National Museum, now known as the Arts and Industries Building, is crowded. On the back wall of the room are the spectacular Catlin Indian Gallery, portraits of Indians and scenes of Plains Indian life drawn by George Catlin between 1832 and 1840. 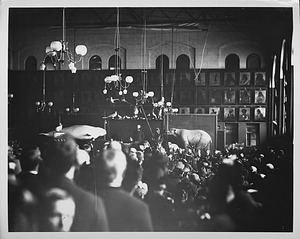 A stuffed bear along with other animals and an Eskimo mannequin has been placed in the front of the hall probably to be used for demonstration purposes. 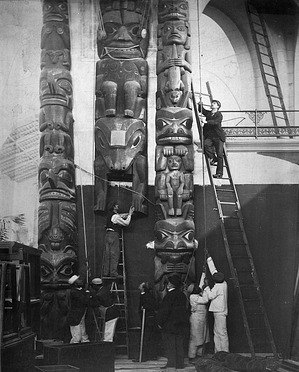 Curators look on as three totem poles are installed in the Northwest Range near the Rotunda of the United States National Museum (USNM), now the Arts and Industries (A&I) Building, by several laborers. Native American Pottery on exhibit in the United States National Museum, now the Arts and Industries Building. 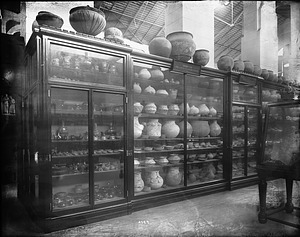 The pottery is displayed in exhibit cases as well as sitting on top of the exhibit cases. Water Transportation exhibit in the Northeast Range of the U.S. National Museum, now the Arts and Industries Building, was a comprehensive display of boat models, from canoes to sailing craft to steam boats. The large Haida canoes from the Northwest Coast made a striking display. Canoes are hung from the ceiling. Models of sailboats can be seen in cases along the walls. 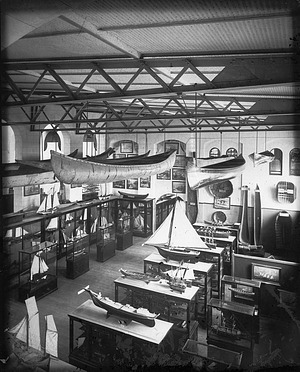 The "Boat Hall" occupied the same space from 1881 when the building opened through the late 1960's. Library, later known as the Jewett Room, in the United States National Museum Building, now known as the Arts & Industries Building, housed the U. S. National Museum library, and was located in the Northwest Pavilion. 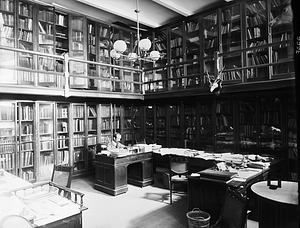 This room later housed the rare book collection. John Murdoch, Librarian of the Smithsonian Institution, sits at a desk. Murdoch was formerly the Assistant Librarian of the National Museum Library and succeeded Miss Jane A. Turner as Librarian April 1, 1887. He resigned May 15, 1892. 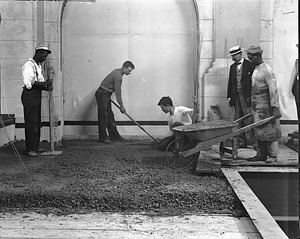 Laborers are laying floors of cement in the United States National Museum Building, now known as the Arts and Industries Building. 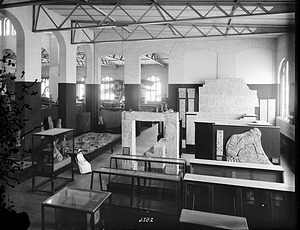 Construction of the galleries (balconies) took place between 1898 and 1906. 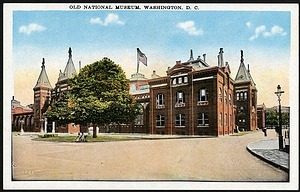 At the turn of the century, visitors are entering and leaving the United States National Museum Building, now Arts and Industries Building, via the North Entrance. The entrance has glass doors, which dates it to before the Hornblower and Marshall designed doors installed between 1902-1907. 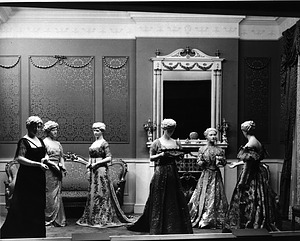 View of First Ladies Hall in the Arts and Industries Building, 1955, showing gowns of, left to right: Edith Bolling Wilson, Ellen Axson Wilson, Helen Herron Taft, Edith Kermit Roosevelt, Ida Saxton McKinley, and Frances Folsom Cleveland. This reinstallation of the First Ladies Gowns was part of the Exhibits Modernization Program of the 1950s. 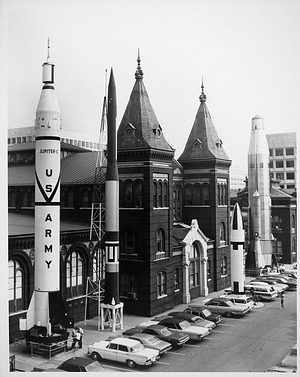 Rocket Row along the west side of the Arts and Industries Building before the National Air and Space Museum was built. The four missiles on exhibit are: From left to right, the Jupiter C, which launched Explorer I, the first U.S. satellite; the Vanguard; the Polaris, the first U.S. submarine-launched ICBM; and the Atlas, the famed Mercury launch vehicle. North entrance of Arts and Industries Building with "1876: A Centennial Exhibition" banner above doorway. The exhibit reproduced many displays from the Centennial Exposition in Philadelphia of 1876.